Need a new ceiling fan? With one quick call to AJP Electric, LLC, you can forget about getting up onto a ladder with a heavy, awkward ceiling fan and dealing with electrical wiring. 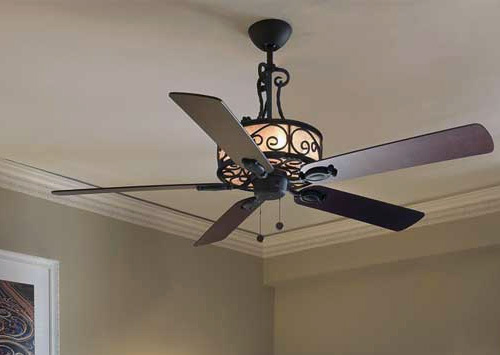 In hot weather, ceiling fans create a cool breeze, making anyone nearby feel cooler. Ceiling fans also keep cool, conditioned air circulating so that it does not become stale. Ceiling fans also help to reduce energy costs in winter. Ceiling fans, set in reverse, make efficient use of that furnace-warmed air, pushing it back downward. Your ceiling fans will be installed to code for safe, dependable operation. AJP Electrical will ensure that fans are flush with the ceiling, without gaps that you might find in amateur DIY installations. We'll ensure that the fan blades are properly balanced for efficient, quiet operation and much more.